The game is divided into three factions: the European Union, Global Liberation Army, and the new Asian-Pacific Alliance. Each faction is powered by numerous generals. These generals each have special units and abilities that change up the strategy of how you can play. It should come as no surprise then that this game takes place in the Generals universe, and in fact, was once called Command and Conquer: Generals 2. 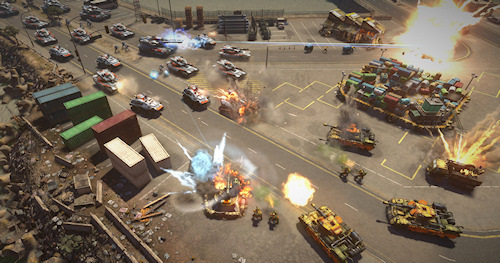 Perhaps the most impressive thing we saw in Command and Conquer were the graphics, powered by the Frostbite 2 engine - which also powers Battlefield 3. The world was vibrant, buildings are fully destructible, and little touches like objects in the game world having full physics applied to them go a long way. The mode we played was called Onslaught, it's a two player co-op survival mode with a few twists. While players each have their own individual stockpile (where players gather resources) - working together to decide what units to build depending on the wave of enemy is key. While earlier waves in Onslaught keep things fairly simple with mostly defensive gameplay, it's the latter waves that mix things up by giving players objectives. "We have these big maps, so this gets you out of a tight little area," said Producer Bryan Farina. Nostalgia hit when the loading screen popped and the command center was available for building. Everything felt familiar, and looked imaginably better. Veterans of Command & Conquer (or any RTS for that matter) will be at home with the tech tree, split up into units of various strengths and abilities, ranging from infantry to mobile artillery platforms. There were three playable generals for each of the three factions. We decided to go with the Junkyard general because why not use scraps you gather on the battlefield to pave your path to victory? The most dramatic change to the series is the addition of generals, with each choice altering your tactics. Each general gets their own abilities that they can use to turn the tide of battle, as well as specialized units that are specific to their play style. Our army consisted of old buses converted into tanks, vans that had been outfitted with toxin sprays, and mobs of infantry carrying IEDs and molotovs. It wasn't a pretty battle, but it was sure fun. So with Command and Conquer being free to play, how does EA plan on monotenizing things? I asked the obvious question if map packs were going to be the primary form. "We don't really like doing that [selling maps] because of what it does to the community, splinters it and dilutes it." Farina told us. Instead the plan is to sell things like skins and more specifically the generals themselves. I also asked Farina about further co-op possibilities in the game. He said the team was considering adding a full co-op campaign along side the game's single player campaign which would be available shortly after launch. We were told over and over by the team at E3 that there are lengthy plans to adapt and support C&C as a service post launch. Of course with any free to play game, that depends on just how well it appeals to folks. 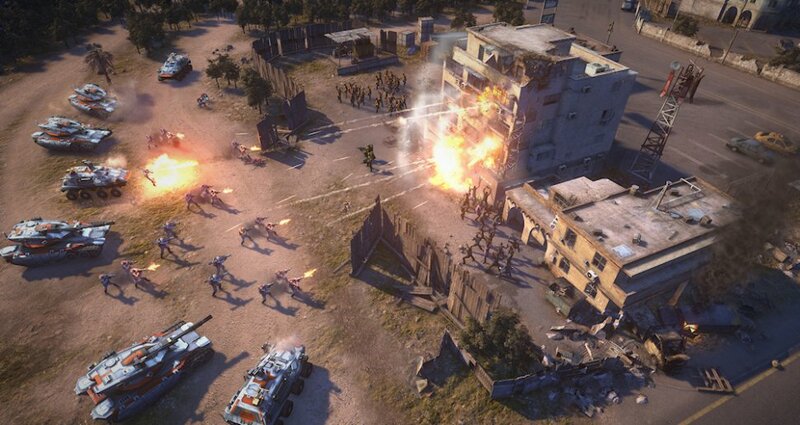 Command and Conquer is in closed beta right now and should launch into an open beta later this year. There's no set release date for the game.